HOLIDAY, Fla. - May 25, 2018 - PRLog -- Morgan Auto Group auto dealership managers and The New Barker magazine will be visiting local community rescue animal shelters on Monday, June 11, to participate in "JUST ONE DAY" events nationally to promote rescue pet adoptions. Each participating dealership is now collecting donations of pet supplies, such as unopened food, kitty litter, pet toys, and any size leashes and collars (even gently used) to help community animal shelters feed and care for rescued animals. 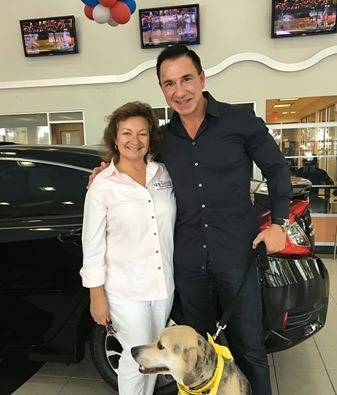 This year, dealership managers will visit designated shelters to learn how each Morgan Auto Group dealership can help them individually adopt out more rescue pets all year long, reducing the need for animal euthanasia. JUST ONE DAY is a national movement to encourage rescue organizations to stop killing animals for 24 hours and find other, more creative ways to adopt out their adorable dogs and cats. Every year,Morgan Auto Group and The New Barker magazine have successfully placed more than 80 rescue pets in forever homes over the last three years by raising awareness of the large number of healthy dogs and cats that are ready and available for immediate adoption through rescue groups, shelters and animal services organizations. The public is invited to stop by these Morgan Auto Group dealerships before June 11 to donate pet food and supplies for the dealership managers to deliver to local shelters. For more information, contact Editor-In-Chief Anna Cooke of The New Barker at 727.214.7453 or visit www.thenewbarker.com. For the most updated listing of participating organizations, visit https://www.morganautogroup.com/news/ or www.JohnMarazzi.com. The hallmark of Morgan Auto Group dealerships is their keen focus on quality cars and impeccable customer service. Founded in 2004 by Larry Morgan and his son Brett Morgan, Morgan Auto Group www.morganautogroup.com is one of the most successful auto groups in the nation, with a broad lineup of auto brands from Ford, Lincoln, Kia, Toyota, Honda, Buick GMC, BMW, Mercedes, Mazda, Nissan, Chevrolet, Chrysler, Dodge, Jeep, Ram, Volkswagen, Mitsubishi, Lamborghini, and MINI conveniently located throughout central and Southwest Florida. For more information, visit or contact one of the JUST ONE DAY participating dealerships above.